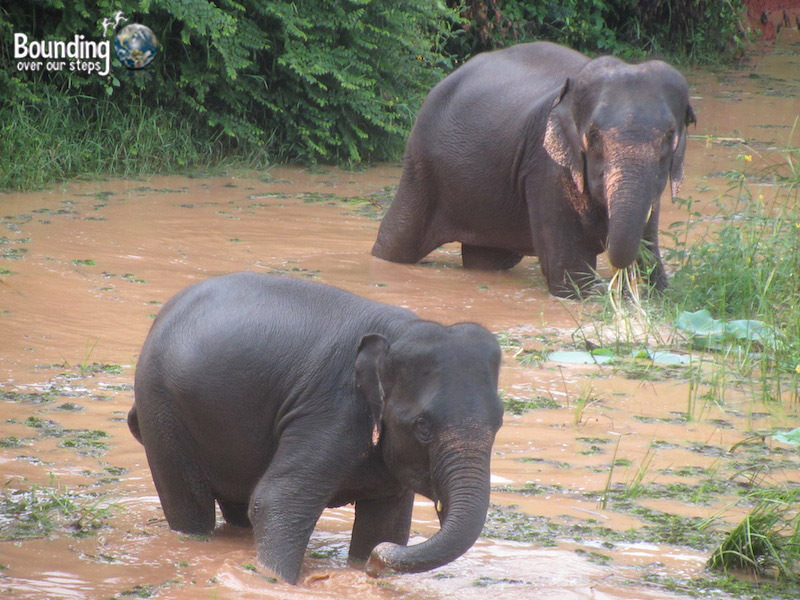 I was very happy to spend one of my last weeks in Thailand at the Surin Project, which helps improve the lives of captive elephants. 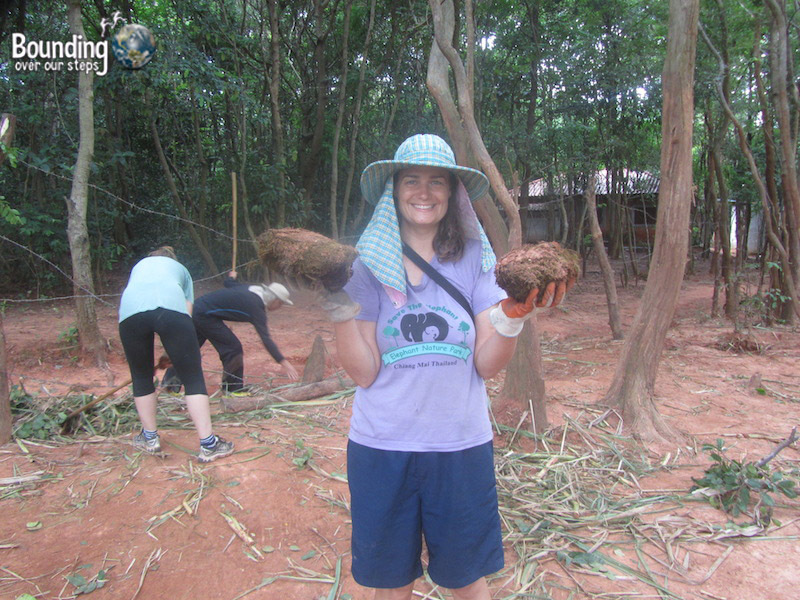 After volunteering for a week at Elephant Nature Park in the north of Thailand, where I learned about the plight of Asian elephants, I was eager to do all I could to help elephants in any capacity. I came away from this experience with a much better understanding of the political, historical and cultural intricacies behind the elephant abuse that is rampant throughout Southeast Asia. For more on this as well as the goals of the project, click here. One thing I wasn’t prepared for though was the amount of fun I would have throughout the week. We were met at the Bangkok bus station where we boarded a bus to Burriram and we traveled by truck the rest of the way to Surin and were shown to our home stay. 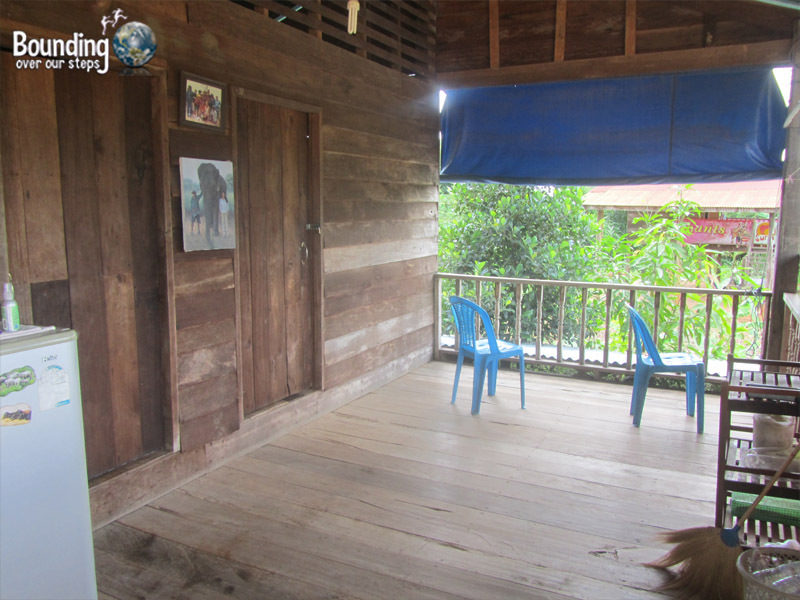 I got to stay at Pi Luck’s house, which was up on stilts with two very basic but comfortable rooms, including a mattress on the floor surrounded by a mosquito net. I made sure to use the several nails sticking out on the walls to hang some of my things, making it feel very homey. Just behind my room was Pi Luck’s elephant, Sai Faa. 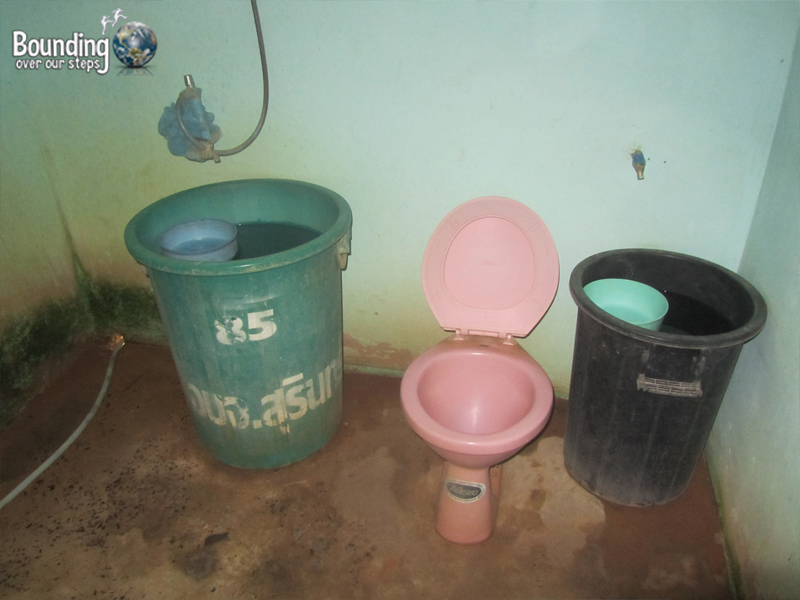 The bathroom was just behind the house and included a Western toilet and bucket showers. I discovered that the best time of the day to enjoy the cold water was in the afternoon heat either just before or after lunch. Sometimes, when I was in the bathroom, Sai Faa would throw pieces of bamboo so they would hit the roof. Pi Luck told me that she did that when she wanted something to eat, which I was permitted to give her in the company of Pi Luck and her husband. That evening, just before dinner I attended the welcome ceremony replete with incense, chanting, candles, water sprinkled on us and special leaves were thrown upon us for good fortune. 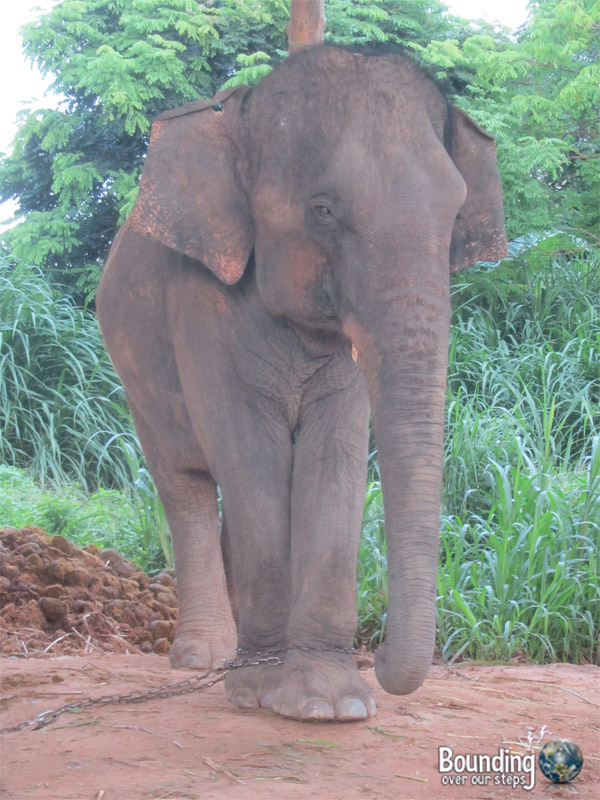 In addition, each mahout (12 in all) wrapped a white string around my wrist, one from each. I realized that the mahouts were greeting me with the same kindness, humor and respect that had been shown to them the previous week. After a very interesting orientation at which the rules of safety, the background of the Elephant Study Center as well as the effects of the deforestation on the relationship of the mahouts and elephants were discussed, we had dinner. I was happy to learn that there were vegan options provided at every meal. 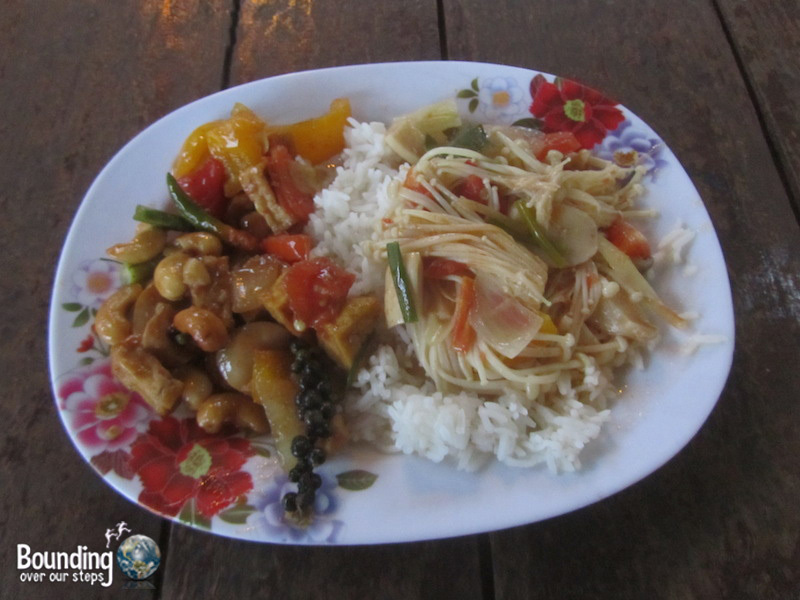 My favorite that night was the cashew stir fry. That night I went to bed early (something good to get used to since I would be waking up early every morning) and was very excited for the next day. After breakfast at 7am my first chore was cutting sugar cane with a machete and spreading it on a field that the elephants would come to later in the day. 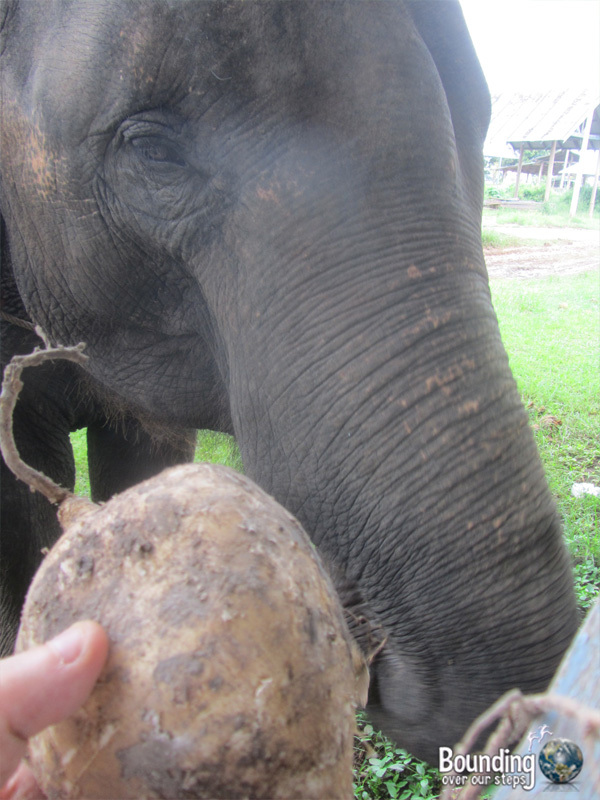 Then we fed yucca to the elephants, which they seemed to love. We then learned how to make paper out of elephant poo at a nearby paper factory before visiting the elephant graveyard. There we were told that the large elephant body first gets buried and about one year later after the flesh has decomposed, the bones are dug up and then buried in the cemetery with a royal marker, signified by the King’s hat on top of the grave. 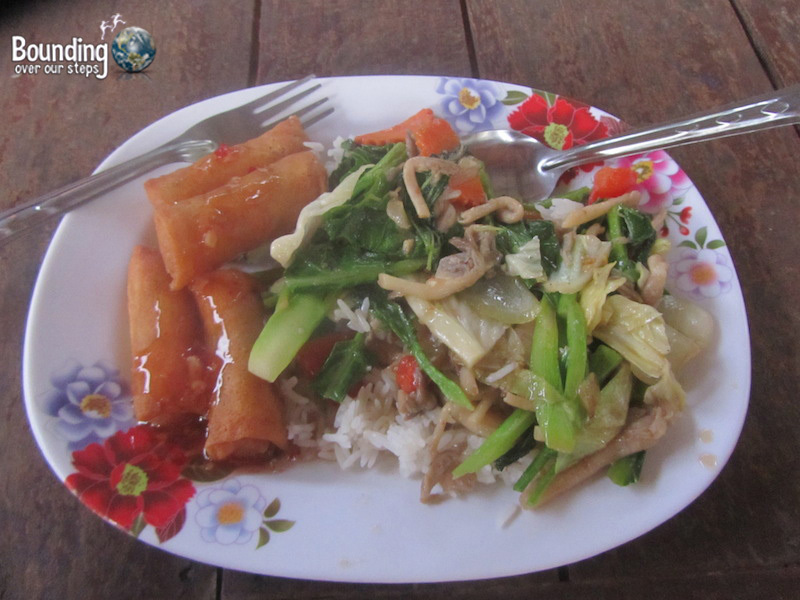 We had lunch at a local restaurant after which we played an ice-breaker game with the mahouts. What we did next ended up being my favorite activity of the entire week: elephant observation time. We watched them for hours playing around in the water and enjoying and fostering the friendships they were making with each other. After dinner we were given a Thai language and culture class. Even after living in Thailand for over 2 years, there was still plenty for me to learn. We began the day by cleaning the enclosures, which involved picking up dirty corn stalks and putting them on a tracker. After a fun ride on the tracker we then spread the stalks in a field to discourage weeds from growing. 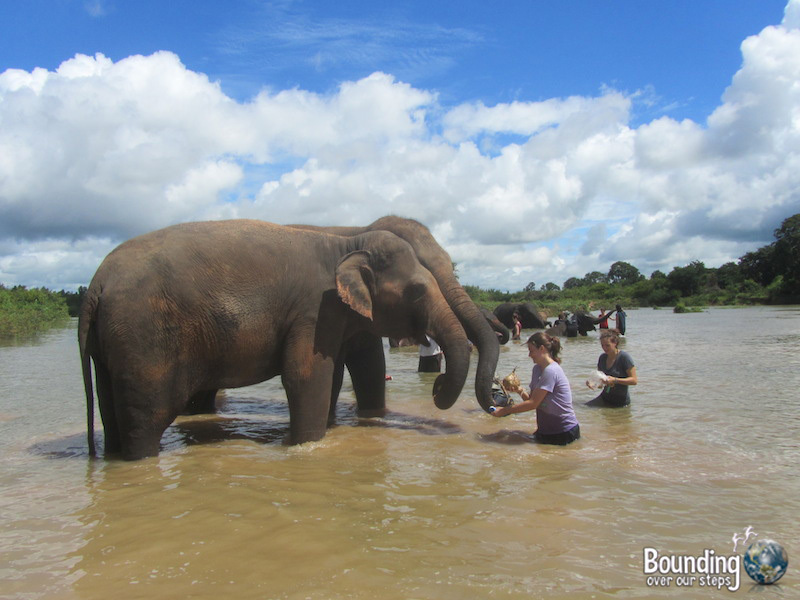 A highlight of the week was elephant bathing. We walked with the elephants through gorgeous rice fields and countryside for about 45 minutes to the river before getting in with them. I bathed Eung Luang. After free time and lunch at a local restaurant, we went to a local primary school where we taught English. My group was given the task of teaching vegetable vocabulary. As a vegan I was happy to teach words like mushroom, carrot and lettuce. It felt surreal to be teaching children outside while elephants walked by with their mahouts, presumably going home after the circus. I very much enjoyed the elephant walk through the woods before heading to a local market with a big selection of fruit, desserts and even some clothing. I tried to find myself a mahout hat but to no avail. But the snake fruit I bought nicely complemented the delicious morning glory and green bean dish I ate. 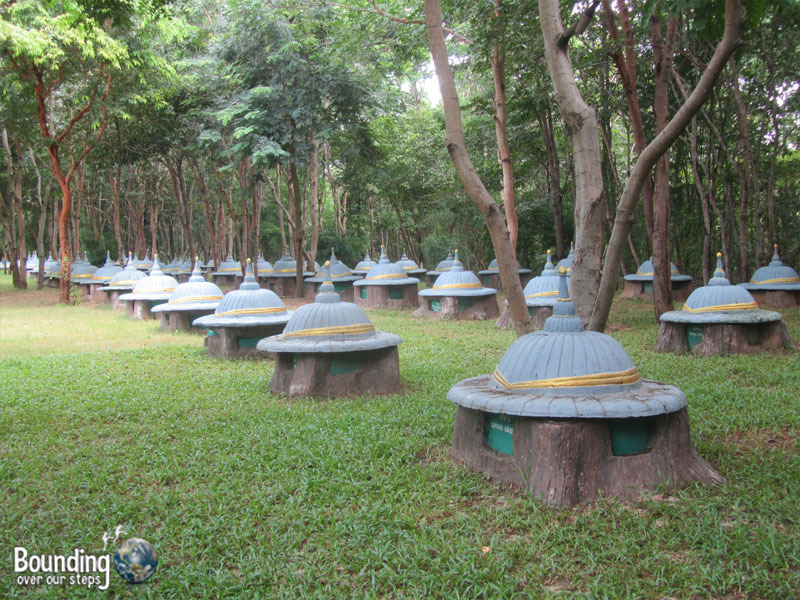 After breakfast we cleaned shelters and the walked with elephants in the forest. The elephants always seemed so (understandably) excited to get off the chains. 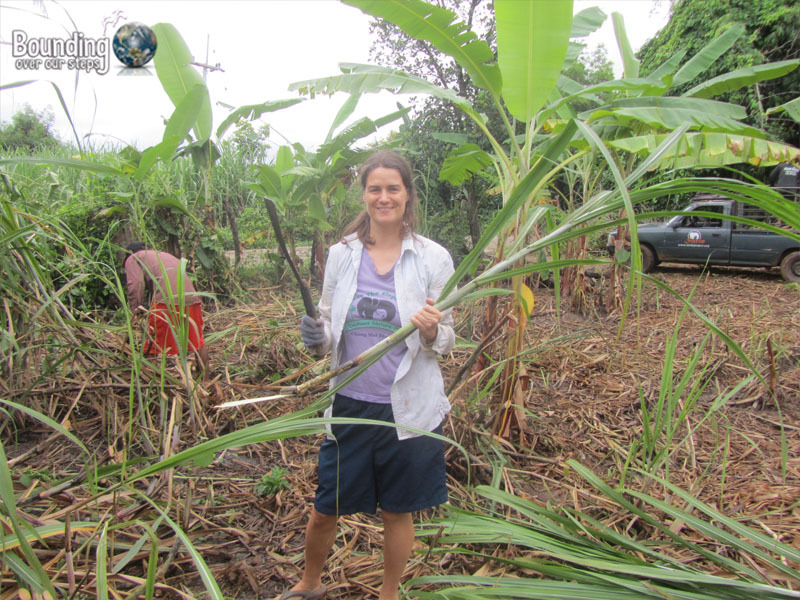 We spent some time weeding in the mahouts’ sugarcane crops just before lunch. I had my camera at the ready for enclosure time but for some reason the elephants didn’t want to get in the water that day. This reiterated the fact that it wasn’t about me; it was in fact, about the elephants and what they wanted to do. I was pleased to see that they were not forced into the water. After cleaning the shelters again we had dinner. I really enjoyed the egg rolls with glass noodles. 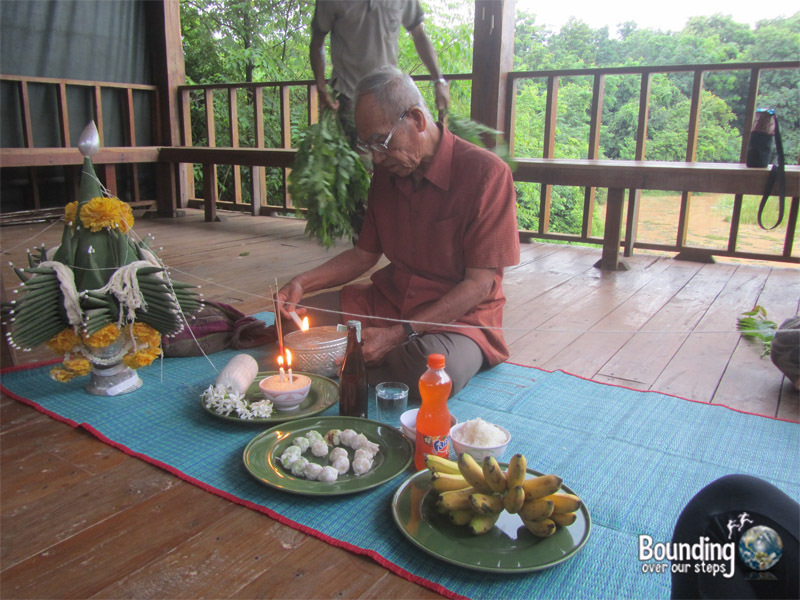 This was also the day we were to take off the white strings that mahouts have given us on Monday evening. I never thought I would enjoy picking up poop as much as I did during the week. There is something about picking up elephant poop that makes it more fun, I guess. 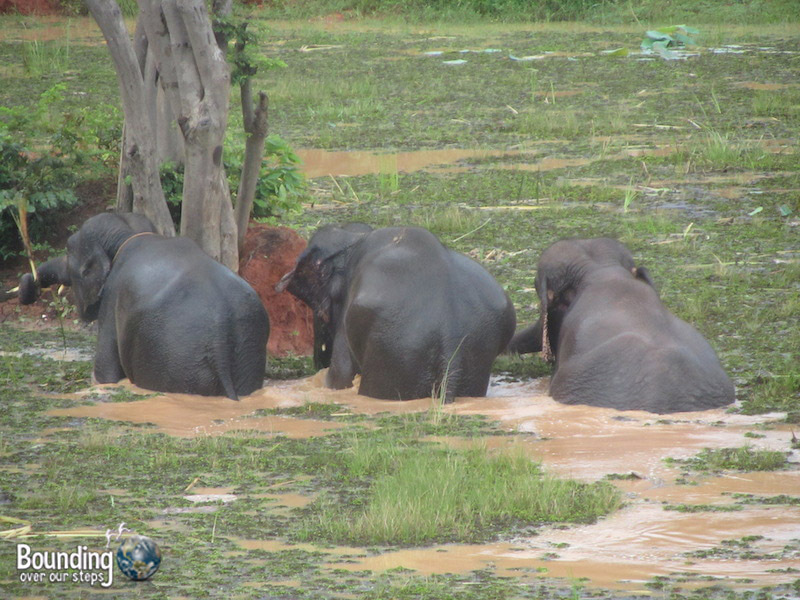 We took the scenic walk with the elephants again to the river to bathe them and we tried a new restaurant for lunch. I ordered the drunken noodles with vegetables and this time it was very spicy! In the afternoon we went back to the school to teach before enjoying another elephant walk. After dinner was the “farang show” (“farang” means “white foreigner” in Thai), which turned out to be a lot of fun. Another volunteer and I taught the mahouts to do the chicken dance and we did a bit of a skit where we dressed up like the mahouts and their elephants and introduced ourselves in Thai. 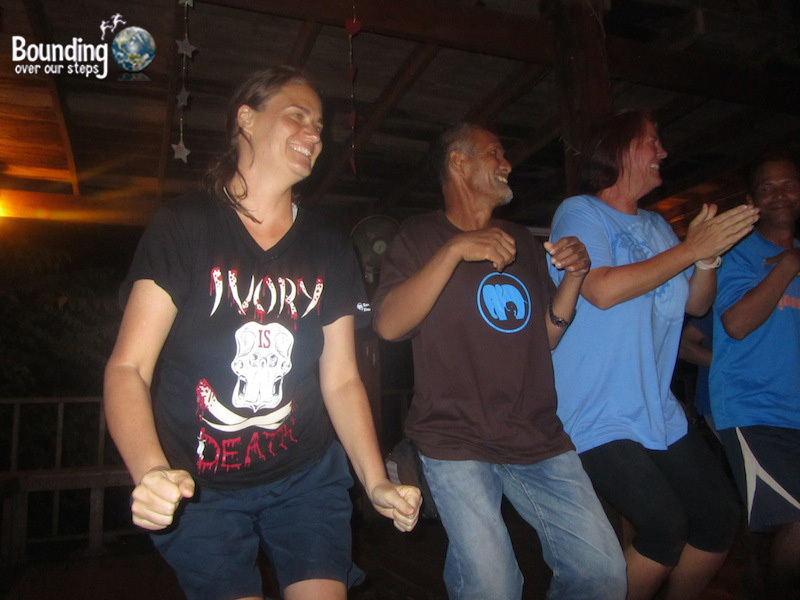 The mahouts seemed to enjoy themselves and were always willing to try even the most ridiculous dances. The evening ended with the “mahout auction”, when all the mahouts bring something to be auctioned, like a memory book they had made, painted footprints of their elephant, hand-made bookmarks etc. These items get auctioned off and the money raised goes to the mahout fund. Knowing that this was my last full day at the project, I decided to get up early and relax in the hammock overlooking the pond, what had become my favorite place in the entire village. 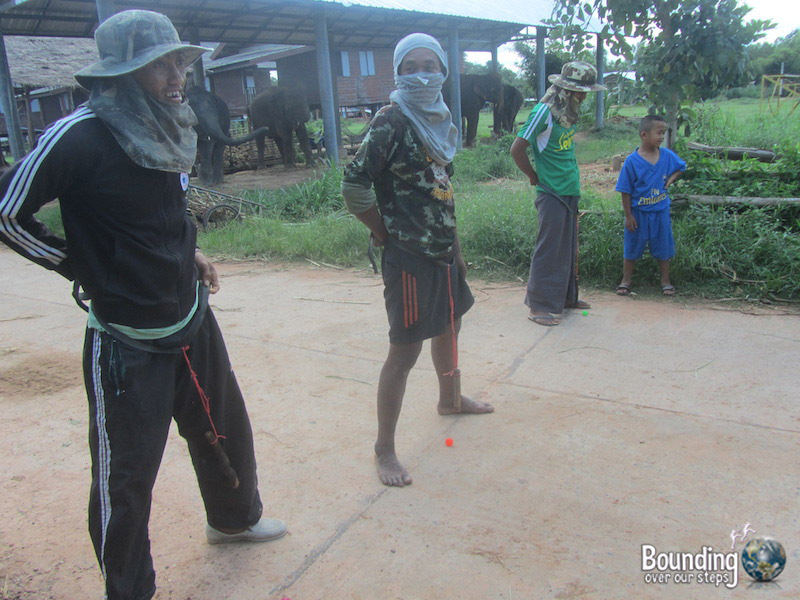 After breakfast I cleaned the enclosures and then we divided into team to play Mahout Olympics. I was on team 3 with one other volunteer and 2 mahouts (I surprised myself with getting 3 bottles down with a slingshot). It was a very fun event and a good opportunity to get pictures of us doing ridiculous things. 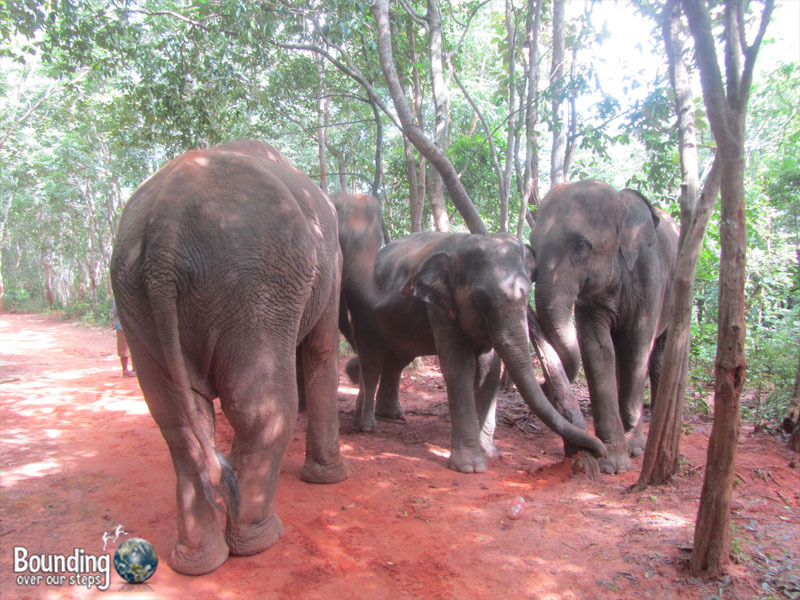 After lunch I enjoyed the long elephant walk, knowing it was my last time being with the elephants. For dinner we went out to a new restaurant across the street from the entrance to the village. After an early breakfast we headed back to the Buriram bus station to catch the 8:30 bus back to Bangkok. Our bus arrived at about 2:30pm. The next time I’m in Thailand, I will most definitely visit the Surin Project again because in my opinion it is one of the most important projects in all of Thailand. I will be volunteering Jan 2016 at ENP and Surin. Thank you so much for the daily routine. I CAN’T WAIT!! !